This hearty soup is rich and wholesome, and really easy to make. Perfect for a cold winter night like tonight. garnish: grated cheese, parsley or coriander or whatever inspires you! 1. Saute onions, fennel and oil, stirring occasionally, for approx. 5 minutes. 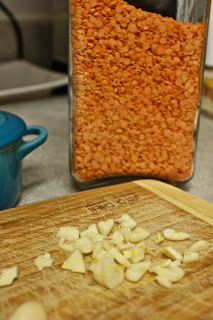 Add the lentils and garlic and cook for 1 minute. 2. Stir in the tomatoes, stock and dried herbs. Cover and bring to a gentle boil. Simmer for approximately 20 minutes (or until lentils are cooked). 3. Puree half the soup in a food processor and mix with other half of soup (to give the soup more texture). 4. Garnish with grated cheese and fresh herbs.